In the decade-plus since Stephin Merritt released his last album as Future Bible Heroes (2002's Eternal Youth), the busy songwriter has released a string of Magnetic Fields discs, a Gothic Archies LP, and works under his own name. Now, he has returned to Future Bible Heroes for a new record. Partygoing is out on June 4 through Merge. 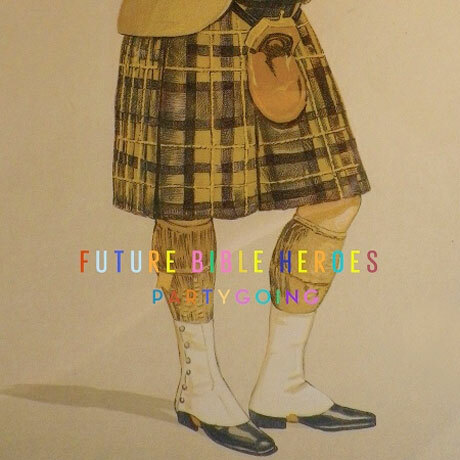 Merritt composes all the lyrics and melodies for Future Bible Heroes and is accompanied by Christopher Ewan (who handles instrumental duties) and Magnetic Fields staple Claudia Gonson (who sings lead). This album announcement confirms promises Merritt made last year regarding his plans for the project. These 13 songs address the ups and downs of partying, and a press release notes, "Partygoing features the signature Future Bible Heroes mix of dancefloor-filling club anthems and super-sad ballads." Single "Living, Loving, Partygoing" falls somewhere in between these two extremes. Listen to it at the bottom of this page. On the same day that this stand-along album drops, Merge will release a four-disc CD collection bringing together all of Future Bible Heroes' past works. The logically titled Memories of Love, Eternal Youth and Partygoing includes all three of the band's albums, plus an additional disc on non-LP cuts (culled from EPs and various compilations). See the tracklist for Partygoing below, and scroll past that to see the tracklists for the remaining discs. Partygoing is available to pre-order here while Memories of Love, Eternal Youth and Partygoing can be ordered here. 9. Don't You Want Me?